Grand Canyon Tours. Considered one of 7 natural wonders of the world, magnificent Grand Canyon was formed over the course of millions of years. One of the most-visited attractions in the United States, Grand Canyon is located in Northern Arizona desert and it is up to 18 miles wide and more than one mile deep from the rim to the Colorado River at the bottom of it. A perfect backdrop, Grand Canyon was used in the biggest Blockbuster movies that have ever been filmed. Every year Grand Canyon sees about 5 million visitors. It’s not a surprise that Grand Canyon is one of the top popular attractions that Las Vegas visitors choose. Breathtaking scenic views, various hiking trails, unique weather and wild life – Grand Canyon is a great place for a half-day or a full-day trip. Grand Canyon Tours offered in Las Vegas are so different in options and price, that it is often hard to make a decision! But there definitely is a tour for any adventurer’s level, taste, and preference. Whether you decided to come to simply enjoy the views (an activity that could take hours), hike (this is one of the best ways to admire the canyon), do rafting, or have a romantic lunch in one of the most beautiful places in the world, you will fall in love with this place. Stop at the Grand Canyon Village (the most popular entryway to the park) – home to Yavapai Point, it is one of the best places to view the canyon. For the most popular Grand Canyon Tours, have a look at the list of available options that you may consider for your day of adventure at the Grand Canyon. South Rim is for sure the most popular tourist destination in the Grand Canyon and is the most accessible to the visitors comparing to the North & Inner Canyon. 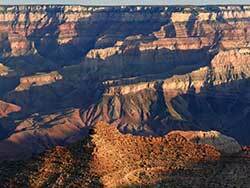 Being a main Canyon route, South Rim has rich history and interesting geological features. Professionally guided South Rim tours in a luxury van include a scenic drive through the Mojave Desert along historic Route 66, a drive through mountains and forests of Coconino Plateau, your time at the South Rim (depends on type of tour) with visiting various viewing areas (including Rim Trail) for stunning panoramic views of the widest and deepest parts of the Grand Canyon. Some tours include lunch at a scenic view place and some other features. A quick journey from the busy Las Vegas and a short distance from the National Park, within the Hualapai Tribal Reservation, is located Grand Canyon West Rim – wild and peaceful. A lot less crowded than developed and bustling South Rim, West Rim has stunning, naturally-formed rocks like Eagle Point (a structure revered by the ancient Hualapai). West Rim is accessible for helicopter landings and is popular for air tours from Las Vegas. The most magnificent part of West Rim is the Skywalk Bridge – the glass walkway between the canyon walls. Best views of Colorado River and stunning sightseeing are guaranteed when you choose one of the West Rim Tours. Standard tour or upgraded tour which includes a West Rim helicopter and a boat ride – both types will take you for the adventure that you will never forget. The North Rim is famous for its wild, isolated trails and only about 10 percent of all Grand Canyon visitors choose it over the rest of the Canyon. Unlike South Rim, which is opened all year around, North Rim is opened from May 15th through October 15th of each year. If you decide to explore this part of the canyon, visit Bright Angel Point to enjoy the views of the Roaring Springs, the only North Rim’s water source. Point Imperial is highest point on the North Rim which also worth visiting. Completed in March, 2007, the Grand Canyon’s Skywalk is the world’s tallest man-made glass-bottomed semi-circular bridge which is standing at 2,300 ft level from the bottom of the canyon. Located at the West Rim, Skywalk extends over it and lets its visitors look down at what’s below… A thousand foot down the glass tourists enjoy the views of the Canyon with a sinking heart. South of the Skywalk entrance, thrill seekers may admire the incredible views when walk up to the very edge of canyon where there are no guard rails. Try A Skywalk Express Tour with Limo and you will have the experience to remember – luxury limo ride, magnificent helicopter views, and breath taking West Rim Skywalk adventure! What a romantic experience! Grand Canyon sees less visitors at that time of the day, and this time will let you capture a spectacular sunset while enjoying a champagne picnic at the Hualapai Indian Land. Rafting tour is a complete different point of view on the Grand Canyon. A rafting trip down the Colorado River is an adventurous tour that will make your day really special. For visitors looking for a little calmer water experience, half-day and full-day trips in the northeastern section of the canyon are available. Adventure lovers may choose the intense daytrip through the canyon between Diamond Creek and Lake Mead (westernmost part) where the river is a lot rougher. Be confident in your rafting/paddling skills when you decide on rafting tours, if you have any doubts about your skills, go for the motorized raft tour instead. Airplane and Helicopter tours to Grand Canyon are very popular among Las Vegas tourists as they save plenty of drive time while offer the unforgettable experience. The aerial excursion will take you over the Hoover Dam, above Lake Mead and Fortification Hill, Temple Rock, Boulder City, and the Colorado River on your way to the Grand Canyon, the key point of your journey. Choose between most popular Soaring Eagle or Golden Eagle Tours for your helicopter adventure to the Grand Canyon.